Technology has made access models ready for prime time. Downloads (both paid and P2P) made perfect sense in the days of dial-up, slower broadband and GPRS. But now ubiquitous high-speed connectivity and cached streaming mean consumers don’t need to get as hung up about downloading to own anymore. Access models are ready for primetime and Apple would be in, driving the market if it wasn’t so terrified about trashing its ability to 32 and 64 GB iPhones and iPads (when everything’s in the cloud who needs local storage capacity?). Of course being ready for primetime doesn’t mean the world will change tomorrow. There is always a long ‘flash-to-bang’ for new technology to manifest itself as consumer behavior. But the inescapable fact is that downloads will eventually become a digital anachronism, an evolutionary dead end. Though again, not tomorrow, because they remain the perfect route for new converts to digital to switch from the CD and because it remains Apple’s core mode, and Apple is the beating heart of the digital music market. But the shift will come. Consumer behavior is moving on and if business models don’t catch up then the illegal sector will fill the vacuum. Everything has happened before and will happen again. 10 years ago when Apple launched the iTunes Music Store artists were up in arms just as they are now, terrified that it would kill the CD and that it would result in consumers dissecting albums. To some degree both those came to pass but you will be hard pressed to find an artist now who does not consider iTunes to be one of, often ‘the’, key source of recorded music income. As the cliché management phrase goes ‘change is difficult’, but it is. No one ever really knows how things will pan out and if you have a degree of stability the last thing you want is to jeopardize that. Taking risks is fine when its someone else’s money and company, but not when it is your livelihood. So it is utterly understandable why there is so much fear among artists and songwriters, but there has to be a belief that the market will find an equilibrium. If the streaming model is unsustainable for any part of the music industry food-chain it will ultimately have to rebalance. Services can’t exist without labels, labels can’t exist without artists, artists can’t exist without songwriters. The concern is whether some artists, services and labels could end up as collateral damage in the process. Transition not cannibalization. Streaming will replace downloads, that much is incontrovertibly true. It won’t happen immediately, but it will happen. To consider the process as ‘cannibalization’ however misses the bigger picture of an inevitable transition in behavior. You could argue that the car cannibalized the steam train, but the answer would not have been to ban the production of cars. 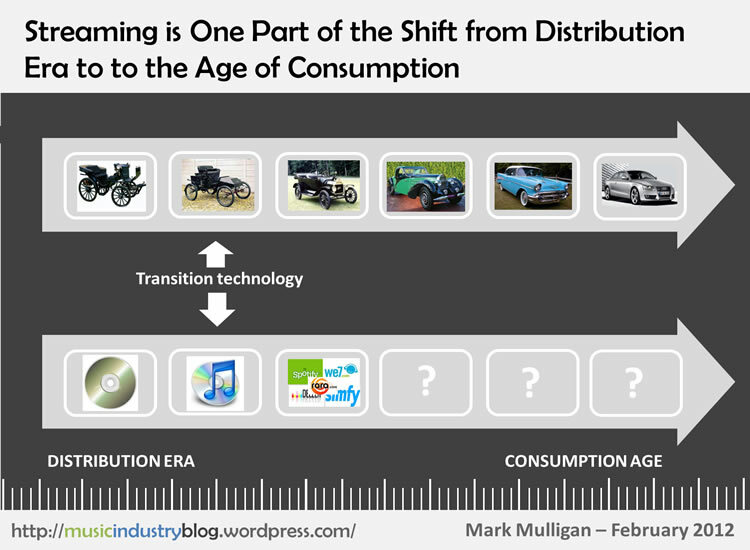 The consumer behavior shift is happening, business models will catch up. Scale might not benefit artists as well as labels and publishers. The holy grail of streaming is ‘scale’. When it is reached all will be well, so the argument goes. Clearly the amount of income will be dramatically better with 100 million paying subscribers but scale may be slower to benefit artists and songwriters. This is because a label and a publisher both have a big pool of catalogue, so a 50% increase across hundreds of thousands of works is going to be measured in millions of dollars while for an artist with a couple of albums it will be measured in hundreds of dollars. Fuzzy data: Artists have become empowered with their ability to shed light on streaming by publishing their payouts. But there are so many variables (what sort of deal they are on, whether they are a songwriter, whether they are recouped etc) that even averaging the data out is problematic. There are other problems too. Many of the artists who pay most attention to the economics of music are later on in their careers, sometime in the sunset of their careers so their overall popularity is on the wane. 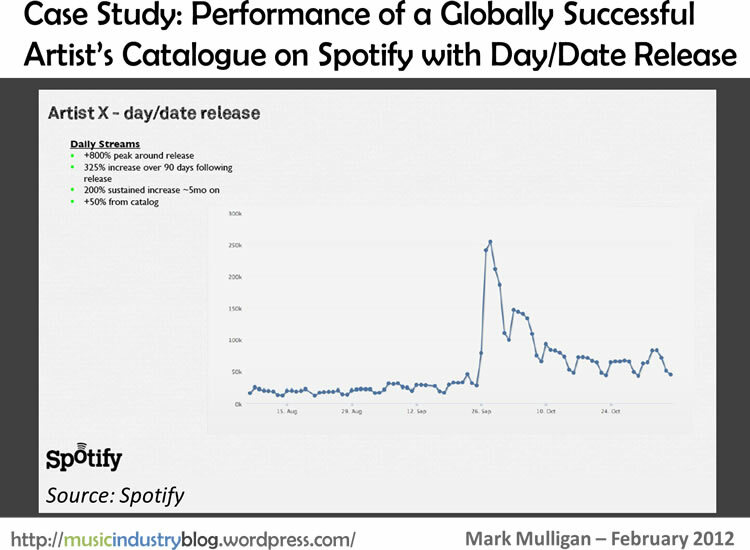 But a factor that impacts all artists is the delay between consumption and reporting, i.e. finding out how much they get paid. With labels the delay is typically quarterly, but with collection societies it is often a year. So much of the data artists are looking at is a year out of date, representative of where the market was 12 months ago but not now. And with the streaming market changing so quickly, this has big implications. Windowing might work some of the time. There is a steady flow of high profile albums that have been held back from streaming services but there is no definitive evidence on how streaming impacts album sales. Coldplay and Adele both held back and had hugely successful album sales. Yet the three artists with the biggest first week album sales in 2013 (Justin Timberlake, Jay-Z and Daft Punk) were all available on streaming services the week of release. There is a very strong case for holding back new releases from free streaming services (why should free customers get new releases the same time as paying customers?) but the case for paid streaming is less robust. The journey is becoming the destination too. Nowhere more so than YouTube. The difference with YouTube is that everyone now accepts it as a crucial marketing vehicle. The problem though is that for so many people YouTube is not just the discovery journey but also the destination itself, what’s more YouTube is the globe’s most popular digital music destination. So instead of driving sales it replaces them for many users. This is particularly true among younger music fans. So even if YouTube was paying out the same amount as subscription services (which it isn’t) artists have a much, much bigger cannibalization risk in YouTube than they do in Spotify et al. This is the core of the streaming challenge – the distinction between what constitutes promotion and consumption is blurring to the point of irrelevance. Right now many of the positioning and commercial mechanics of free streaming services and tiers is that of promotion, even though they are also consumption. Pricing and product must evolve. Streaming pricing and product sets must evolve. 9.99 is not a mass market price point, however good value it may represent. In fact it is the entire monthly spend of the top 10% of music buyers. Much more needs to be done around testing pricing elasticity, else subscriptions will never break out of their aficionado niche. There are a few interesting experiments, such as MusicQubed and Bloom.fm which focus on curating small amounts of content at low price points. But much more needs to be done on this front, the leap from free to 9.99 is too big. There must also be innovation in the product experience, and Deezer’s, Spotify’s and Soundcloud’s developer platforms all look like great environments for such innovation to occur, but they’re not enough on their own. Product and pricing need to be used strategically to target services at discreet consumer segments. The 2000’s taught us that one size does not fit all for digital music, the same applies to subscriptions. One key way the mainstream services can start segmenting their offerings is by providing artist channel subscriptions were a user pays $/£/€1 per month per artist. Income comparisons are not binary. A comparison of the amount of money earned (across all rights holders) from a paid stream (c.$0.01) versus that of a paid download (c.$0.70) is always going to look catastrophic. But these rates are points on a much larger scale, with the download at one end and terrestrial radio at the other. In the US terrestrial radio does not pay anything to record labels and in Europe rates are far, far smaller than streaming services. The assumption has always been that radio is so important a discovery channel that paltry rates are tolerable. But if music sales are diminishing then radio has the same ‘journey as destination’ problem as YouTube. The challenge for artists and songwriters is to work out where the sweet spot on the scale is for them. Where is right balance between discovery and income generation? Rethinking the life-time value of a song. In the past the commercial value of most songs peaked during the course of a few months, tailed off steadily for another few months and then nearly flat-lined thereafter. For big artists and big hits the tail off would be longer and the flat-line would be replaced with a steady after life. 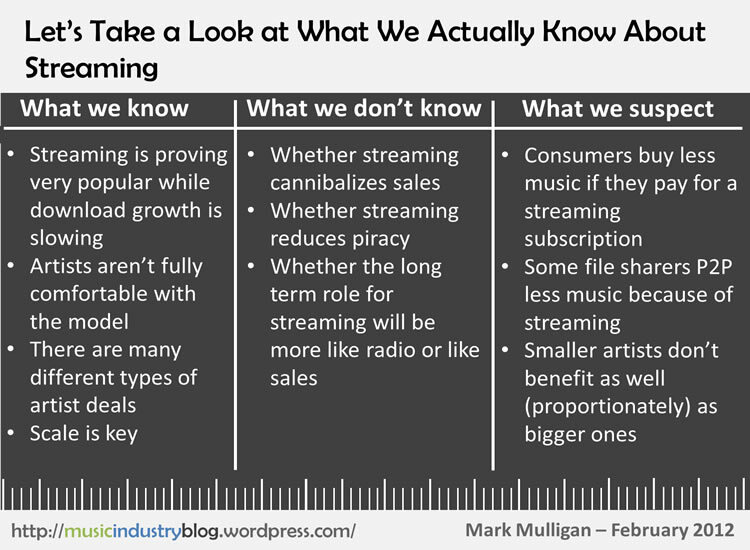 Streaming changes that in three ways: i) fewer song purchase transactions occur, meaning less money up-front, ii) money is generated direct from listening long after the original release iii) streaming services drive strong consumption of catalogue. So artists will see a shift from immediate big income to long-term steady income. The question of whether one will equal the other will become clear in the next 2 to 3 years. See my consumption analysis for a view of where it may get to. The listener net widens. While it is clear that an album being listened to a dozen times on Spotify is much less valuable to an artist than if it had been bought on iTunes, that comparison assumes it is a case of one or the other. But what is becoming increasingly clear is that more artists are getting listened to by more people. The absence of the price barrier means people are eagerly trying out new artists. And in many cases the listener would never have bought the album anyway. What’s more, after having streamed it a few times, they may even realise they just don’t like it that much. In the analogue era that would have just been a disinterested listen to a single on the radio, with streaming it is direct revenue. The artist is thus getting money from a consumer that does not even like them enough to proactively spend money on them. It may be small revenue, but it is ‘found revenue’ that would not have existed anywhere else. Things will get much worse unless more change happens. Digital music revenue is not growing quickly enough, in fact growth is slowing. Global digital revenues grew more slowly in both absolute and percentage terms in 2012 than they did in 2011. Globally digital is still only 38% of music sales and in Japan, which may become the world’s largest music market this year, 80% of sales are physical and digital has been in decline since 2009. It is wrong to assume that the market will naturally ‘go digital’. At the current trajectory it will not. Experimentation with new models and products is crucial. We are back in the ‘throw it all at the wall and see what sticks’ phase we were in during 2007-9. This time though artists and songwriters are part of this, both because they have found their voice and because DIY/Direct-to-Fan services are part of the mix. The next five years will be the most important phase of change the music business has ever gone through. The last 10 years has given us a solid foundation of options but it has also created a hornet’s nest of inequities, mistrust, misgivings, threats and disruption. 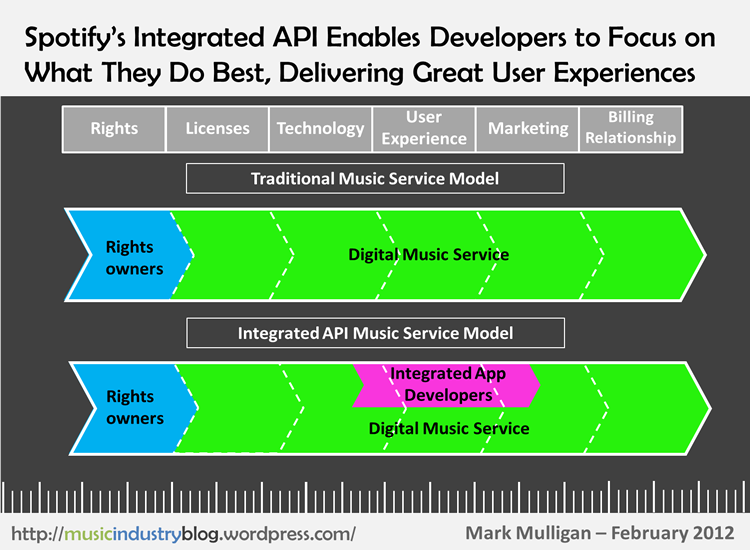 Labels, publishers, songwriters, artists, music services, tech companies must all learn how to create a sustainable music ecosystem that benefits all parties. A naïve aspiration? Perhaps, but the current ‘what’s in it for me?’ ethos will only result in unnecessarily dismembering an industry that is perhaps finally ready to start on the path to recovery. For all of the undoubted positive impact that streaming services continue to have on the digital music market one of the key challenges they pose is the subjugation of the artist brand to that of the music service. With download services and CD stores the customer buys artist specific products, but with a streaming service the transaction is for all of the music in the world. The brand of any individual artist is inherently diluted. Artist apps are thus an artist-level subscription for the most engaged music fans, an opportunity to develop artist brand experiences across digital platforms. However as more of consumers’ music experiences occur within access based environments, more needs to be done to build artist specific experiences within them. Doing so not only makes good business sense, it makes for better user experiences too: 20+ million tracks is a meaningless consumer proposition without an effective means of getting to the miniscule fraction of that content that any one consumer is interested in. Core catalogue: The entire standard catalogue of the artist programmed with editorial such as story of the making of each album and features such as musical influences. Exclusive and rare catalogue: Music that is not available elsewhere on the streaming service, such as unreleased rarities from each album, remixes, specially made tracks for the artist subscription etc. This might require some rarer content being withdrawn from the main service to be held back for the artist subscriptions. Exclusive programming: Non-standard music content such as acoustic sessions, simulcasts of concerts, music video etc. Non-music content: Audio visual content that helps tell the artist story, such as editorial, photo shoots, artwork and video storyboards, artist interviews, back stage footage, live chat sessions with artists etc. It is crucial that artists streaming subscriptions are not simply a collection of playlists. Though delivering such a diverse suite of content types will clearly require a user experience above and beyond that of the standard streaming service. It does not however require a fundamental reworking of streaming technology architecture. Instead these app-like artist experiences – and app-like experiences is exactly what they are – can leverage the app developer platforms most streaming services already have. Indeed, the success of artist subscriptions depends upon them being immersive, programmed and interactive experiences, telling the artist’s story to new fans and enriching it for existing fans. The programming effort will of course be significant and the burden will need to fall as much on the labels and as it will the services. Having labels co-run artist subscriptions also makes sense from the business perspective as it gets around issues of charging for streaming apps – TuneWiki’s demise is recent evidence of the problem created by 3rd parties not being able to charge for streaming apps. To mitigate resourcing concerns, a template-orientated approach will ensure scalability as well as a consistent user experience. It will also be possible to rotate a majority of the content over periods of 4 to 6 months. This is because just as music buyers buy an album and listen to it for a time before moving onto a new one, artists subscriptions will be swapped around and changed on a constant basis by users. Most fans will have a few artists they will always want to keep connected to, but will also want to have ability to deep dive into a new selection of artists every month or two. Monetizing the mainstream: For as long as the price of mobile enabled subscription services remain out of the reach of mass market music fans they will struggle to have mainstream appeal. Pricing experiments will play an essential role in the mainstreaming of music subscriptions but even more flexibility will be needed if they are ever going to match the spending patterns of an audience anywhere near as large and diverse as the current base of download buyers. Artist subscriptions give consumers the familiarity and flexibility of a la carte spending dynamics but the user experience benefits of subscriptions. Thus consumers can build their expenditure at a pace and level that matches their appetite. Creating artist specific revenue: Artist subscriptions also help mitigate the threat of streaming services turning download dollars into streaming cents. They do so by giving consumers the ability to commit spending to the artists they like, and by enabling artists to build rich, immersive channels of content and editorial around their music. The revenue opportunity for artists can be extended further by tight integration of ancillary revenue retailing, such as exclusive live-streamed sessions, merchandize and concert tickets. Ease free users into paid subscriptions: If artist subscriptions are additionally made available to free tier streaming users they present these users with the opportunity to ease themselves into subscriptions. Zero to €/$/£9.99 is a big leap, but zero to a few dollars or euros is a far more palatable shift. To deliver clear value artist subscriptions will need to provide mobile and ad free listening even when paid for by free tier subscribers. This will additionally help drive free-to-paid conversion by accentuating the usability contrast with the rest of the streaming experience for free tier users. Once they have started enjoying the benefits of ad free mobile listening for a small selection of artists, the chances of migrating them to full subscriptions are much increased. A careful balance will however need to be struck to ensure that consumers do not swap $/€/£9.99 subscriptions for 3 or 4 artist subscriptions. Giving music fans the music they want: Artist subscriptions give users an alternative, and far more intuitive, way to navigate streaming services. At the most basic level they can be thought of like smartphone and tablet apps, supercharged bookmarks, gateways to immersive and interactive artist experiences. At a more sophisticated level they can become the foundations of the programming architecture of streaming subscription services. Artist channels can be grouped into collections such as genres and decades to cerate music channels, which then can be sold as bundles in the same way a pay TV provider sells bundles of programmes. Instead paying for movies, sports and documentary packages, streaming users could opt for bundles such as ‘alternative rock’, ‘EDM’ and ‘Urban’. The bundle approach is not without its complexities, such as how much of an artist’s standalone subscription content would get into a genre bundle, and which artists would make it in. But the clear advantage of the approach is that artist subscriptions, and bundles of them, turn the amorphous mass of streaming services into richly programmed music content networks. The pay TV model translated for music. Streaming subscriptions still have a long way to go before most doubts will be eased, but streaming artist subscriptions represent an opportunity to accelerate the process by simultaneously addressing concerns of sustainability, user experience and artist pay outs. Streaming artist subscriptions are not the entire answer, but they can be a big part of the puzzle. 2012: Growth – both in terms of the number of people who are now paying for music again and the growth in payments back to artists as a result. 2012 was the year when people realised the future growth in the music industry is coming from streaming services. 2013: The abundance of choice. How do you make sense out of 20 million songs? 2012: The streaming market continues to progress at breathtaking speed and we’ve seen some incredibly positive developments in 2012. Most exciting for us, is the fact that targeted online content has developed into something much, much more sophisticated than just algorithm-generated recommendations. We’re seeing the focus now shift towards personalised music curation. At Deezer we’ve gone a step further, developing really bold new product innovations that are designed to put integration with apps, social media and digital services at the forefront of our new user experience. Our aim is to help music fans discover and share music and promote new artists. That’s why our local editorial teams work hard to create suggested playlists and recommendations to give music fans a more personal and individual service. 2013: Getting as many people as possible to find out about services such as ours! We’re convinced that the future of digital music will rely on music discovery and re-establishing the emotional connection between music and people. Our mantra is to help people rediscover music, through recommendations by real people all over the world. Our locally-based editorial teams share new music from upcoming local artists, not just in their own countries, but with the other editorial guys around the world – another example of Deezer taking music even further regardless of boundaries. Now our biggest challenge is to get people everywhere to find out how intuitive – and fun! – it is to use Deezer, and we hope to make great strides on this in 2013. 2012: Looking back, 2012 was the year that streaming became mainstream. We’ve seen a rapid evolution since streaming music was freed from the PC and became a constant companion via smartphones, to this year, when streaming made its way into the living room and into cars—the two places where people listen to the most music. Streaming services are everywhere! This heightened awareness has resulted in more consumers embracing the model and eschewing their old beliefs around the need to own their media; which has given rise to more investment in the sector, innovation around business models and M&A activity. After spending the past 10 years forging the path and taking those proverbial arrows, we are finally seeing the realization of streaming music’s promise. 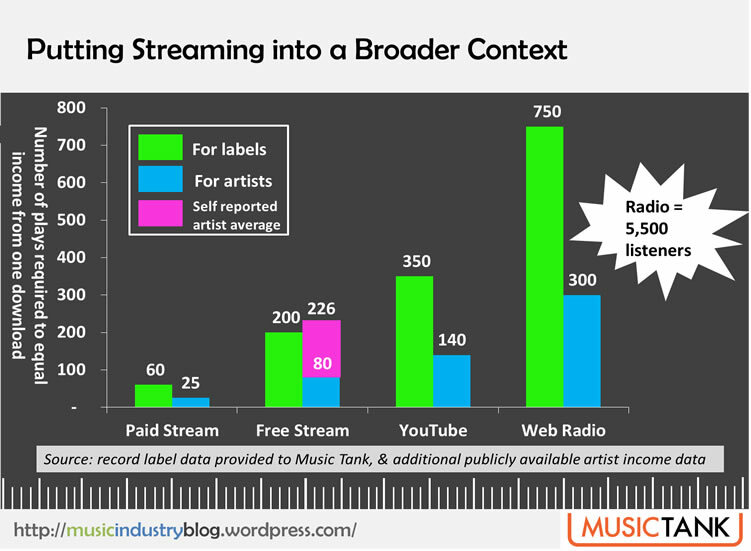 2013: The most important issue of the mainstreaming of streaming is that artists are paying more attention to how they’re being paid on the various streaming services. Artists are seeing a lot of streams, but are not seeing a lot of cash for them. This makes them justifiably nervous that streaming services are getting popular at the expense of digital sales–and in some cases withholding their music from streaming–a detriment to the growth of these services, just as they become popular. The solution of the problem is twofold. First, we need to do a much better job at education about how artists are compensated and creating transparency around where streaming revenues flow. Streaming services have a responsibility to innovate around artist compensation to get more money into artists’ pockets and help them understand how their music is being consumed. I think there is a lot more that we can—and should—do to ensure that artists are fairly compensated for their music and are extracting maximum value from streaming services. 2012: Two things, in the UK, the silent landmark in 2012 was the launch of the BBC iPlayer Radio app this has the potential in 2013 to be the catalyst for mainstream adoption of streaming, without the need to know its streaming and secondly the driving momentum of smart phone and tablet adoption reaching what I believe was a tipping point in 2012. 2013: In 2013 the dream would be easier licensing, more flexible pricing plans removing the artificial technical and commercial barriers with the ability to demonstrate clear ROI’s but in reality for any of the models to work they need the true internet scale that is possible and to achieve that we need to find the means to enable mass market adoption. This is the elusive jewel in the crown that we all should be really seeking to solve. 2012: Social media has had a profound impact on the way music is shared, which is something we anticipated when we first built Rdio. 2012 also saw the entry of services into global markets (with our own service expanding to 17 countries). The continued growth of mobile around the world with faster speeds and better phones also contributed to the rise of music streaming in 2012. 2013: Awareness is still a key factor moving into 2013. We’ve seen a big shift in 2012 with more services opening up globally, but we aren’t truly mainstream yet. Innovating on discovery is a key focus as well. With all the songs in the world at your fingertips, creating fun ways to decide what to play next is a challenge. We built Rdio with human powered music discovery at the heart of the experience and we’ll continue to enhance discovery across platforms moving into 2013. Another key issue moving into the new year is the our responsibility to the artist community. We’ve started to address this through the recently launched Artist Program and will continue to work closely with artists to help them create new revenue streams and tap into new opportunities generated by the streaming music model. 2012: The introduction of frictionless music sharing across social networks has led to a massive increase in the adoption of music streaming in 2012. 62.6 million tracks were played 22 billion times across Facebook in the first 12 months of open graph coming to the network. In the UK UMG reported that 7.5bn tracks had been streamed in 2012 to mid November; a 700% increase on the 1.1bn tracks streamed in 2011. 2013: Despite the huge rise in popularity of streaming, there’s a lot more work to do before the mass market transitions from music ownership to the access based streaming music services. Increasing adoption of tablet computing is making it easier for people to consume digital entertainment content while high speed broadband and 4G mobile networks deliver more data to us faster. However it will be the ways in which streaming services enable simple but engaging access to music through recommendations, sharing and curation which will be key to driving wider consumer uptake in 2013. 2012: 2012 was a year when many of the mainstream music service providers realized that the typical mobile music consumer is seeking more effortless and delightful entertainment. This is something we had already understood and rolled out to over 20 markets around the globe with Nokia Music, the most satisfying and compelling mobile music experience to date. 2013: In 2013, we expect others will follow our lead and work hard to remove barriers to usage and some have already announced that they also need to solve the consumer issues that we identified long ago. Rest assured that Nokia Music will continue to innovate and deliver the music that people love in the most satisfying and intriguing mobile experiences. We welcome all to discover and enjoy it. 2012: The beginning of consolidation in the industry, which I believe we will see more of in the coming year. 2013: The big discussion on sustainability of the business model throughout the value chain. 2012: In 2012 we’ve seen streaming services go mainstream. With the proliferation of innovative services such as Spotify, RDIO, Pandora, Rhapsody and QQ, we now have access to more music than ever before. At Sonos we’re dedicated to providing music lovers with the simplest way to enjoy all the music on earth in every room and our partnership with such popular music services has ultimately seen our customers consume twice as much music. 2013: 2013 must bring a healthy debate on the value chain of artist to consumer within streaming, and it’s essential that this is resolved to ensure the artist gets paid and the consumer gets a great experience. We are just beginning this dialogue but it absolutely needs to be continued in earnest over the next year. 2012: It was streaming’s big year. Finally the confluence of ubiquitous connectivity, and smartphones and tablets going mainstream has created the necessary market conditions for streaming to step up to the plate. It is still very early days and streaming revenues are dwarfed by download and CD revenue, but finally there is the glimmer of a ‘digital plan B’. The artist streaming debate was a useful coming of age for artists, but too much data has too often been misinterpreted, creating a confused marketplace. 2013: 9.99 is not a mass market price point, somehow (bundling, discounts, pricing innovation, partnerships etc) that price must come down to drive wider adoption. Also the value chain must work out a transparency solution that can work within the restrictions set by commercial relationships. Artists may never get the full picture, but it is in the interest of all parties that they get as much of it as is possible to help them make informed opinions. Finally, the elephant in the room remains YouTube. More catalogue than any of the other services, video (of course), great functionality, on every smartphone and tablet, and all for absolutely nothing. That creates a playing field that is anything but level for the rest. Today UK-headquartered streaming service Rara issued a slew of announcements (squeezed in just ahead of Apple’ iPad mini launch) including expanding from 20 to 27 markets, increasing their catalogue to 18 million tracks, iOS and Windows apps and a deal with Lenovo. Rara have been in the market for some time now but have largely slipped under the radar. Now though they appear to be ready for taking a shot at the big time. There is of course no shortage of streaming music services (Spotify, Deezer, Rhapsody, Wimp, Simfy, Sony Music Unlimited etc etc) but there is also a massive amount of opportunity. Streaming will become increasingly pervasive as the music world continues its steady switch from the distribution age of selling-units-of-stuff to the consumption era of access-trumping-ownership. In fact streaming will become so ubiquitous that it will become anachronistic to talk of ‘streaming services’. Streaming is merely the technology that enables on-demand, consumption based music experiences. So when the leading on-demand services only number their total users in the low tens of millions and paying users in single digit millions, while Apple touts 450 million credit card iTunes accounts, the scale of the untapped opportunity is abundantly clear. The challenge is how to sell streaming to the masses. Personalized radio is one approach: Pandora have made a lot of progress, with more than 150 million registered users and 7Digital just announced a $10 million finance raise to (among other things) pursue their own personalized radio play. Rara’s strategic ambition though, is to take on-demand streaming to the masses. Rara has built its user experience and market strategy around targeting the mass market consumer, opting for moods and a visual navigation approach over the traditional list-based navigation. But an inherent difficulty with selling premium subscriptions to the mass market (Rara do not have a free tier) is that those very consumers are the ones who are going to find renting streaming music an unfamiliar concept. Rara have built a service designed to demystify streaming. The partnership with Lenovo (Rara will be pre-installed on laptops and tablets) will help. But a new stealth competitor will be present on those devices, in the shape of Microsoft’s subsidized xBox Music on all Windows 8 devices. When you consider the challenge of persuading a new laptop owner to pay for a music service when the device comes with a free music service embedded in the OS you realize just how disruptive Microsoft’s new music play is. As I have said before, I’ll be very interested to see what the European Commission make of xBox Music’ Windows 8 bundle, considering that years ago they compelled Microsoft to unbundle Windows Media Player from Windows for being anti-competitive. The xBox challenge is of course a hurdle all music service will have to navigate, but Rara will be hoping that being pre-installed on the devices of one of the world’s biggest PC manufacturers will give them an advantage over the rest. The music streaming world is one full of contrasts and inconsistencies. At one end We7 and MOG sell for peanuts; in the middle Rhapsody, Sony, Rdio, Wimp, Rara and others continue to steadily build a market; and at the other end Deezer and Spotify are sucking in investment with the force of a black hole. Spotify’s investment is well documented, but this week Deezer confirmed their seat on the fast train with a $100m investment from Access Industries, which also just happen to own Warner Music. Leaving aside for a moment the intriguing fact that the two streaming global super powers are European, Deezer has managed to slip beneath the radar of the often US-skewed digital music world view by pointedly deciding to ignore the US market (for now). Like a canny general who decides to march around a heavily fortified stronghold and thus effectively leave it stranded behind enemy lines, so Deezer expects the streaming war to waged on different shores. They are both right and wrong. There is no doubt that the US paid streaming market is overly catered for at present, and that Deezer would struggle to get any foothold. Also there is clearly a much bigger scale opportunity in the remainder of the globe. However, and somewhat paradoxically, the US market should also have much much more space, plenty enough for Deezer, Spotify and the rest to flourish in. The problem is that the $9.99 streaming monthly subscription is not a mass market value proposition and it is not about to suddenly become one. We have had the product in market for over a decade, if it was going to hit hockey stick growth we’d have seen it by now. To be clear, this is not to say streaming music is not a mainstream proposition, but that the $9.99 streaming subscription is not. And that is a problem, because it is clear that for the economics of streaming to add up (for artists, services and labels alike) scale is key. Pandora’s Tim Westergren has made the case for lower statutory streaming rates to drive scale, it is probably time to start a parallel dialogue for on-demand streaming. But lower wholesale rates alone won’t fix the problem. The market still desperately needs more mobile carriers, ISPs and device companies to start hiding in their core products some or all of the cost of subscriptions to consumers. Cricket Wireless, Telia Sonera, France Telecom and of course TDC have all made solid starts but more, much more, is needed. And of course there is an elephant in the room: Apple. Apple have played their hand cautiously to date, conscious of their hugely influential role in the digital market and indeed in the music industry more broadly. If they get their streaming play wrong (and there will be an Apple streaming play eventually) the results could be catastrophic for the music industry. 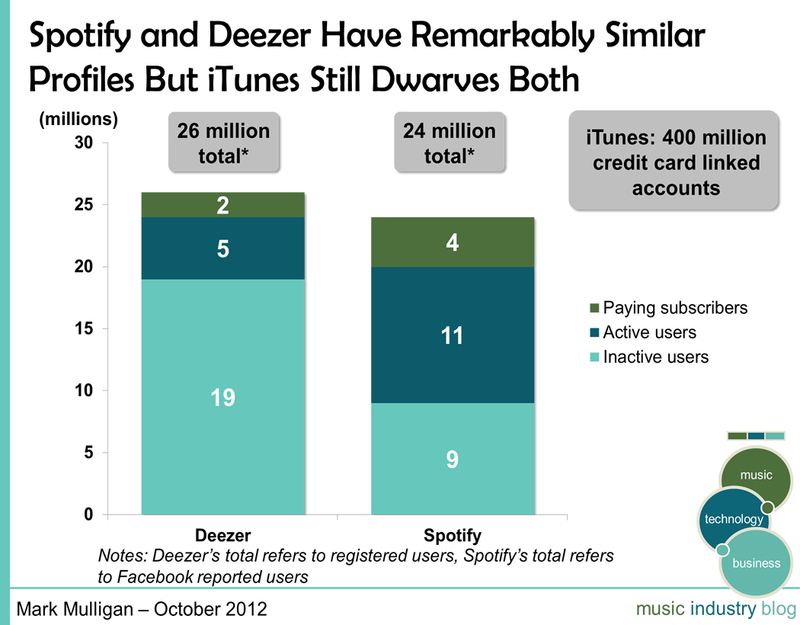 Apple’s 400 million credit card linked iTunes accounts dwarves Spotify and Deezer so it is understandable that the they each want to make hay while they can. But the streaming pricing problem still needs fixing, and soon.